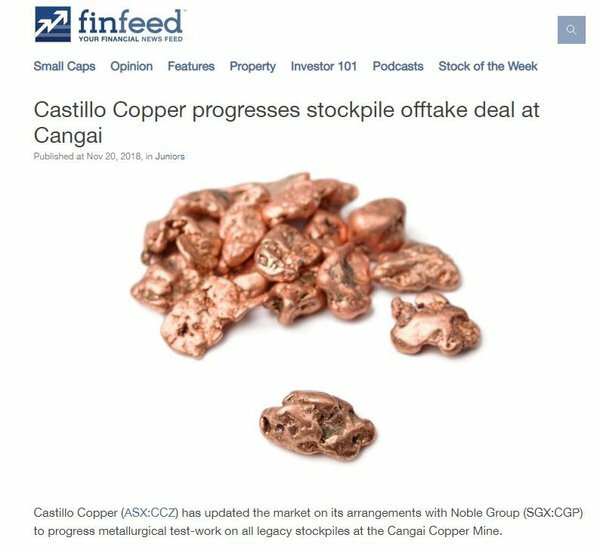 Castillo Copper (ASX:CCZ) continues to gain momentum at its Cangai Copper Mine near Grafton in northern NSW. Over the course of two drilling campaigns, CCZ has produced its best results. 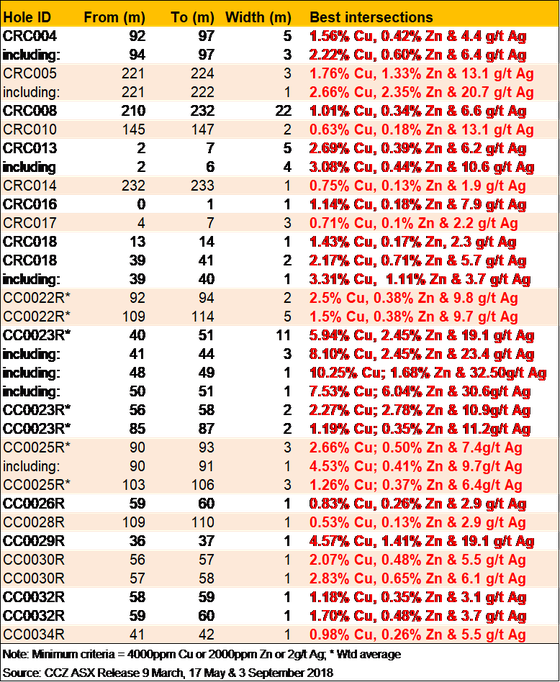 The best coming via hole CC0023R which delivered 11m @ 5.94% Cu, 2.45% Zn and 19.1 g/t Ag from 40m including: 1m @ 10.25% Cu, 1.68% Zn and 32.5. g/t Ag from 48m. These results all point to the company potentially being able to re-open the Cangai Copper Mine. 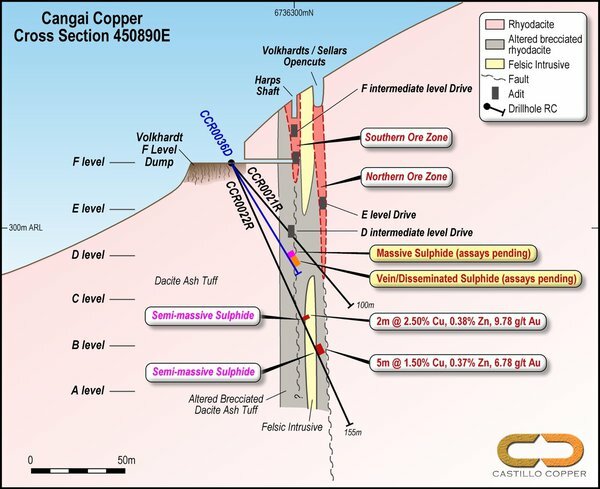 The Cangai Mine is CCZ’s flagship project, comprising a volcanogenic massive sulphide (VMS) ore deposit, with one of Australia’s highest grade Inferred Resources for copper: 3.2Mt at 3.35% copper. If you have followed the CCZ story, you will remember that the Cangai mine shares similarities with the $1.07 billion capped mining giant Sandfire Resources (ASX:SFR). Both miners’ projects carry supergene ore and high-grade copper. Supergene ore can be shipped directly to key export markets at relatively low cost via excellent infrastructure already in place which could give CCZ a competitive advantage in the long-term. The latest work done by CCZ, builds on earlier work by the company that not only discovered the Sandfire similarities, but also confirmed that Cangai is arguably one of Australia’s highest grading copper deposits especially with high grade diamond drill core being extracted from shallow depth. Diamond drill core samples are now being assayed, which likely means plenty of news flow to come in the ensuing weeks and months. Furthermore, down-hole electromagnetic (DHEM) survey results have been finalised, with several new sizeable massive sulphide target conductors apparent. Again, these demonstrate the potential scale of Cangai Copper Mine. With new high-grade targets, the RC drilling program is being optimised and factored into the remainder of current Phase II campaign. CCZ continues to hit its milestones and could be in for a break out year in 2019, so let’s take a more in-depth look at how it has been progressing. CCZ has today provided an update on preliminary diamond drilling results and final assays for drill-holes CC0025-34R and DHEM survey findings. These diamond drill results underpin Cangai’s status as a high-grade polymetallic deposit. 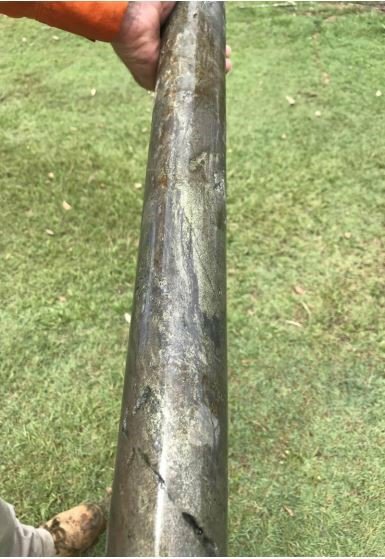 A 9.6m mineralised diamond drill core intersection was extracted (CC0036D - see below) from a shallow 50m. This included two sub-intersections exhibiting mineralisation up to 45% chalcopyrite and 15% sphalerite, which are now being assayed. Now, here is a look at the 36D cross section. 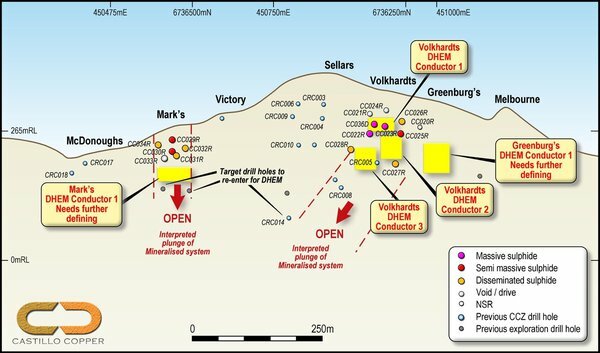 CCZ’s diamond drill team targeted a known quantity near Volkhardts’ lode that hosts massive sulphides but from a different position to the previously drilled hole CC0023R. Drill-hole CC0023R, the standout, delivering excellent results from shallow depth including: 11m @ 5.94% Cu, 2.45% Zn & 19.1 g/t Ag including 1m @ 10.25% Cu, 1.68% Zn & 32.5 g/t Ag from 48m. Here's a look at the best intersections over the two drilling campaigns. CCZ's best intersections are highly impressive and confirm the project's status. The drill core proves encouraging results. Those results alone are extremely encouraging. Now add in two massive sulphide intercepts from 49.9m to 51.2m and 53.6m to 54.2m. These intercepts comprise chalcopyrite, pyrite, pyrrhrotite and sphalerite that are hosted within heavily bleached dacitic ash tuff's of the Siluro Devonian Willowie Creek Beds. All collected samples have been sent to the laboratory to be assayed which should confirm the high-grade polymetallic system prevalent at Cangai Copper Mine. These earlier findings continue to place the Cangai Copper Mine deposit as one of the highest grading in Australia. Undertaking DHEM surveys has been key to identifying several sizeable high-grade massive sulphide conductors under the Greenberg, Volkhardts and Mark lodes. Encouragingly, after analysing the data, the geophysicist consultant determined the mineralised system below these conductors is open at depth – clearly highlighting the potential scale of the ore body at Cangai Copper Mine. CCZ’s geology team now has several new, high priority massive sulphide targets to optimise and factor into the balance of the current Phase II drilling program. Moreover, further DHEM work will accompany the remainder of the drilling campaign to garner a broader understanding of potential extensions to the known mineralisation. We can expect further results to come shortly, with the RC drilling team expected to head back to the site to complete CCZ’s Phase II campaign. We alluded earlier to the fact that Noble Group is currently conducting metallurgical test work. CCZ has an arrangement with Noble Group to progress metallurgical test-work on all legacy stockpiles at the Cangai Copper Mine. CCZ's arrangement with Noble Group is important to its future success. 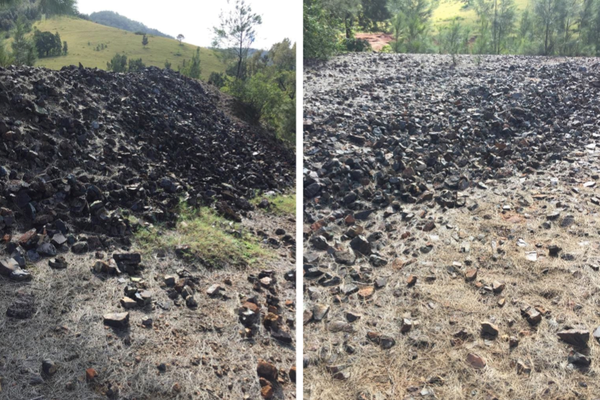 CCZ’s geology team collected samples from the stockpiles (seen below) around the Mine and the old smelter and sent them to Noble for third party verification and optimisation. CCZ hope to improve on these results and aim to complete a binding off-take agreement with Noble Group to distribute up to 200,000t of copper concentrate. This agreement would be pivotal for CCZ as it will validate the high-grade polymetallic nature of the ore body at Cangai Copper Mine and provide early-stage cashflow. More results. More drilling. That’s what we can expect from CCZ as it closes in on finalising its Phase 2 drilling campaign. We already know that the company has uncovered high-grade mineralisation that takes it one step close to re-opening the Cangai Copper Mine. These are significant achievements at a time when the global EV battery market is set to grow at a compound annual growth rate (CAGR) of 42% to 2021. Remember, copper is a key component in electric vehicle batteries and power electronics. CCZ is currently capped at $23 million and is a long way from the billion dollar Sandfire, but should it continue to release highly encouraging results that lead to the reopening of the Cangai mine, it could very well rise in value very quickly. With drilling to be completed in the coming weeks and months and further results due imminently, CCZ is in a strong position to capitalise on the hard work it has done so far.